"Iran" and put you "president" of Iraq .. Barzani "attacks" Barham Saleh and his adviser ..
Thread: "Iran" and put you "president" of Iraq .. Barzani "attacks" Barham Saleh and his adviser .. The tension between the Kurdish component and the leaders of the Iraqi state, continues, where the Kurdistan Democratic Party launched an attack on the Iraqi president and his adviser Amir Kanani leader of the Sadrist movement. Accused the party led by Massoud Barzani, according to spokesman Mahmoud Mahmoud, adviser to the Presidentthat he carries out the task entrusted to him to mislead and brainwashing, he said after saying that Iran offered 100 million dollars to be held by Barazani Iraqi presidency. 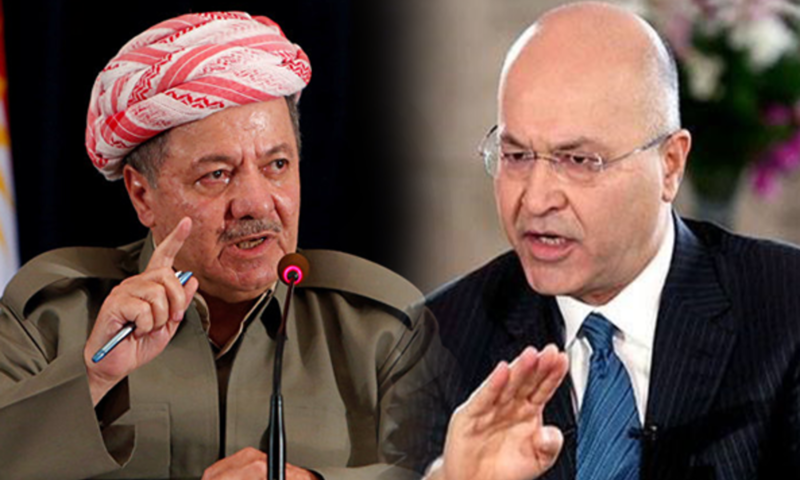 According to a statement issued by the spokesman of the Kurdistan Democratic Party, Saturday, February 9, 2019, the statements of the Chancellor in the Presidency of the Republic of Kenya related to Barham Saleh and Barzani and the Democratic Party, which he reported on the Iraqi channel just a brainwashing remarks have nothing to do with reality. Stressing that what he said about Iran's dissatisfaction with him or his boss Barham Saleh, is not true, because if she were not satisfied with what came Barham Saleh, President of the Republic and what became Kanani adviser in the presidency now.